As someone who likes to time-travel, and loves movies that are set in the past, like "the Old West", I'm always fascinated by what people looked like. That is, what they wore, how they wore their hair, every tiny detail, even their teeth. And I've seen a lot of excellent movies that have gone to great pains to make every detail as perfect as possible - the types of guns, the dresses the women wore, the exact detail of the harnesses on the horses. But I rarely see what must have been very common at the turn of the century, teeth that to us we would associate with very old people. Even people in their twenties and thirties would have had teeth that nowadays we would associate with old people. And it was starting to change by the 1920s, as you can see by this ad. 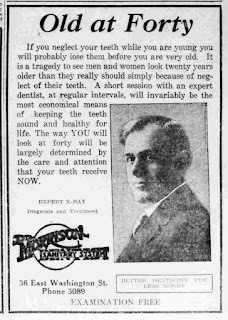 What Dr. Morrison is saying in that ad is that you don't have to look old at forty, as long as you take care of your teeth. And nowadays we take that for granted so much that it's hard to imagine someone as young as forty having teeth that nowadays we would associate with someone who is 90, or 100. Or having no teeth at all! Expectations of what "looking old" was changing. 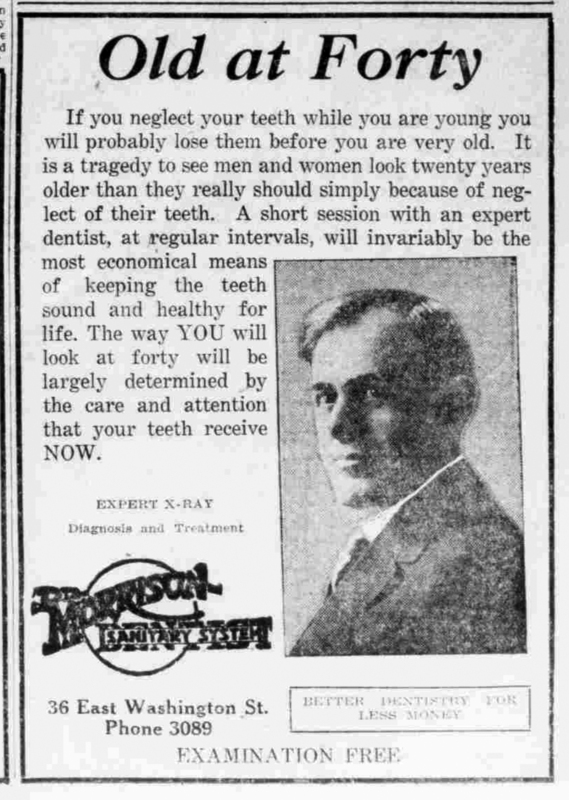 And while dentistry in Phoenix in the 1920s would be barbaric compared to now, back then it was life-changing. People started taking care of their teeth at an earlier age, and by forty they didn't expect to look old. It must have been amazing to see. People who had seen previous generations, born in the 1800s, would marvel at how youthful the "old folks" looked! I'd like to think that everyone just smiled all that much more!